Somebody pinch me!!! I just won an a NATIONAL award for my image titled 'Fallen Angel' at the 2018 Professional Photographers Of Canada awards banquet!!! These images are judged by nationally accredited judges next to the highest level in Canada!!! CANADA!!! 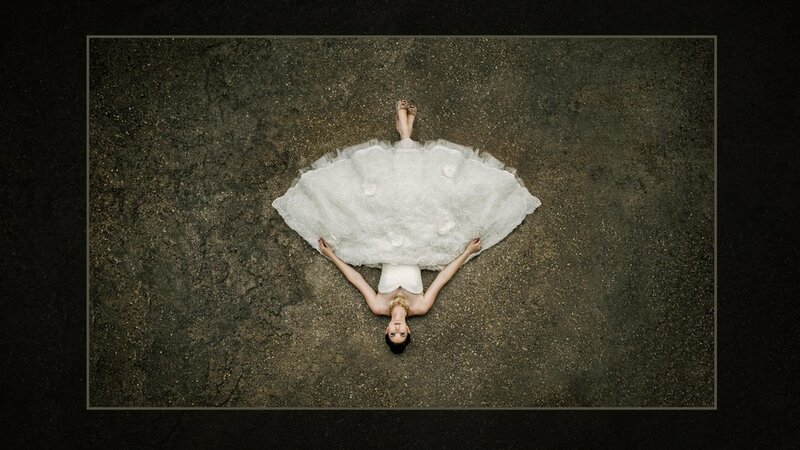 This image has won two awards provincially and recently picked up 'Best in Wedding Portrait Class' at nationals. Only one of these awards are handed out each year. I remember going to my first awards banquet my first year in business, thinking how on earth will that ever be me? The quality and ideas of these images were far greater than anything I could ever produce and the photoshop skills were out of this world! Fast forward 11 years, and here I am, accepting my first national award. There is only one award greater than this and that would be winning "Photographer of the Year". While these awards aren't handed out lightly, it's always great to have some goals right;)? I would like to give a huge shout out to the PPOC, without this organization, there would be no precedent for photographers in Canada. I have learned so much through this amazing organization and continue to do so even after 11 years in business. I came home from this year's convention and awards banquet feeling so excited about what's to come. I have so many great ideas I want to implement in my business, and I think our clients are going to LOVE them. "My favorite part of the course has been meeting others that I can bounce ideas off of and get advice from. It's also been so amazing to witness the evolution of my peers in their business ventures. Although getting pregnant and having a baby threw a bit of a wrench into my business timeline, I have started building a foundation for the future and learned things that I will build upon when I am able to jump into photography with both feet. Mandy is so knowledgeable and has been completely transparent - she has been such a great mentor and has laid out all of the failures and successes she experienced along the way. With Mandy's guidance and the support from the girls, I have become more confident in my abilities and have learned to value my work and my time!" If you are interested, please email us for an application form! Thank you so much! That's right, we are moving, but not to worry, we are staying right here in Saskatoon. We are just moving to our very own photography studio space. It has been an incredible year sharing a Saskatoon photography studio with Joi Photo, but to see the growth we plan for our company, we decided to get our own space! I will certainly miss the beautiful building we are in right now, but I am so excited to move into a brand spankin' new studio space! If you wanted to get in on one of our last sessions in the beautiful 100 year old building, our last booking in our current studio will be January 13. Our new studio will be up and running by the end of February. Thank you so much to Crystal at for opening your doors to us one year ago, it has been a pleasure to work alongside Joi Photo in your beautiful studio. Thank you to everyone for your continued support! I'm so excited for what's to come!!! It's begining to look a lot like Christmas! Xmas Minis!!!! Now that Halloween is over we are finally in the Christmas spirit! 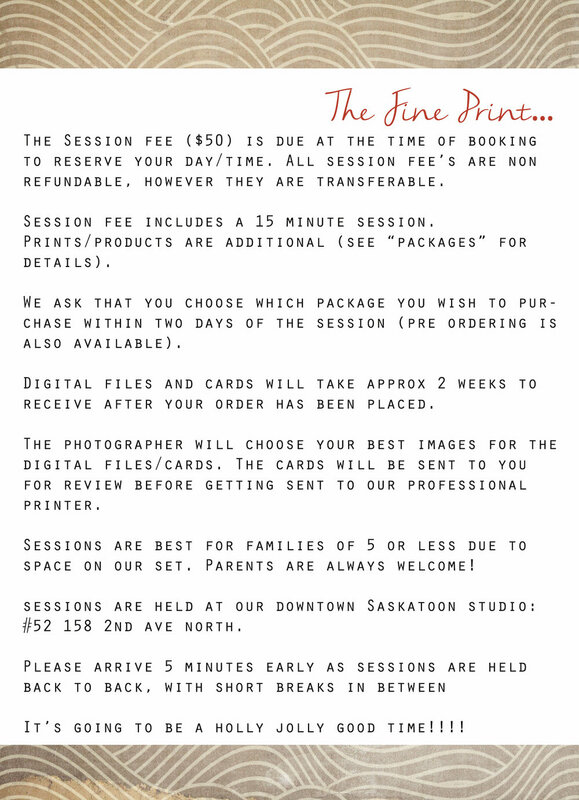 We are holding a couple of days of Christmas Mini's at our Saskatoon Photography Studio!!! November 11 & November 12!!! Is the session fee just $50? What does that include? -Our session fee for the mini’s is just $50 and that includes your 15 minute session. -Orders can be placed before the big day (to get your images quicker), or within two days from your session day/time. -We require the $50 session fee as your non refundable retainer. If something comes up and you aren’t able to make it, your session fee is transferable. -The whole family is welcome! Depending on the ages of the kids, we suggest the sessions for families of 5 or less due to the size of the set. Please ask if you have a special situation! What is the deal for your clients? -All of our past/present clients will receive 50% off our session fee! So if you’ve ever purchased a session fee with us (weddings included), your session fee will be just $25!!! I am not a past/present client? Any way I can get a deal too? -Well, we are feeling quite generous! All orders that come to $200 or more (including session fee) will receive a free mini framed photo to adorn your Christmas Tree! These baby’s are CUUUTE! And if that’s not enough?! 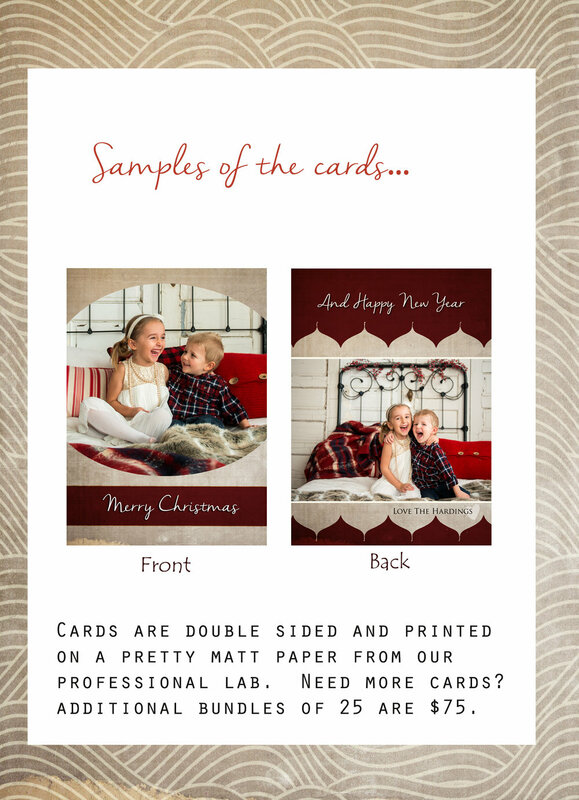 The first two families to sign up will also receive 50% off their session fees, no strings attached! "You never really know the value of a photograph until long after it's taken." This sits with me on so many levels. Not only do I think about this all the time with my sessions, it hits so close to home with my personal photos. This is the reason I get my family photos done every year. This is a shot of my girl and I, a few years ago, at our annual family session. I love the wrinkle in her nose, and me looking adoringly at her. I know when she gets to my age, she is going to cherish this photo even more than I do today. She's not going to see my double chin, or my wrinkles, or my crooked nose. She's going to see the connection between her and I, and how stinkin' adorable she is. She might even see her own kids in her squinty smile, and laugh at how ugly my jacket is. What I do know, is she will look back at this photo, long after I'm gone and it will be worth so much more in years to come, than it was the day it was taken. With Mother's day right around the corner we wanted to write a blog post about something that isn't often talked about but should be celebrated: All of the mother's who don't physically hold their children in the arms, but hold their children in their hearts. All the Mother's who have lost a child. "Mark and I have been together since 2009, and have been married for 2 years. Constantly surrounded by a slew of adorable nieces and nephews, we were excited to start our own family. We found out we were pregnant in April 2015, and due December 21 - one day before Mark's 30th birthday; we were so excited for our precious combination birthday/Christmas gift to arrive. I had a textbook perfect pregnancy. I felt great, we had a fantastic OBGYN and local family doctor, and we got to see our baby twice via ultrasound; once at 12 weeks and again at 20 weeks. Everything was perfect, baby was growing and developing on track, we were enjoying feeling baby's kicks, picking out names and getting the nursery ready. By mid-October, we had started visiting the doctor’s office every 2 weeks to get measured, weighed and listen to the heartbeat. On October 26th, at 32 weeks, we went in for our standing appointment, and couldn't hear the heartbeat. Our doctor instructed us to leave immediately and drive straight to RUH, where she would call ahead and arrange for someone to be waiting for us at fetal assessment. Before we left she hugged us both and said, "I am worried for you, but whatever happens, we will get you through this". We drove the one hour to Saskatoon in almost complete silence, holding hands, and with tears streaming down both of our faces. Although we didn't officially know anything, we were both preparing ourselves for the worst. When we arrived at fetal assessment, I was admitted and they again tried to find baby’s heartbeat. When they still couldn’t find it, they quickly moved us into the ultrasound room for a scan. 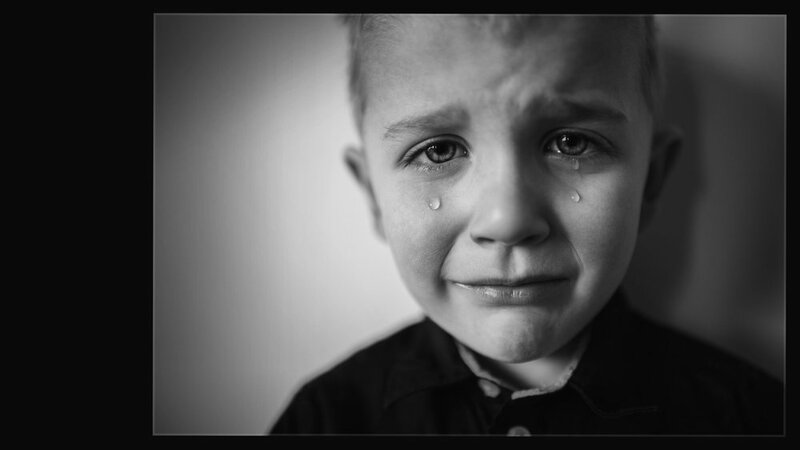 One of the on-call doctors scanned me, turned to us and said the words no expecting parents ever dream of hearing, "I'm so sorry, but your baby has passed." We then had a short discussion about our options and decided we would head home to pack a bag, turn around and come back to the hospital. It was in the ultrasound that the doctor suggested that we might still want to pick out a name for our baby, bring something special for baby to wear and perhaps invite a photographer to join us in the delivery room. On our drive home we called our immediate family members and let them know what had happened. Walking into our house, past our baby's room and trying to pack a bag to go to the hospital was so surreal. We had no idea what we would need. I went into the baby's room to get a receiving blanket and a onesie and that's when reality really hit me, we were going to the hospital to have our baby, but we would never be bringing our baby home. On our drive back into the city, I contacted Mandy, I had just seen her the weekend before when I participated in a wonderful photography workshop she facilitated. We made it back to the hospital and checked into the antepartum ward around 9:00pm. The nurses were wonderful, they were all so empathetic and truly caring, it was a good thing I had thought to grab a few boxes of quality Kleenex, as it was definitely well used that evening. I was induced and my contractions started around midnight. We didn't get much sleep that night, although we tried. My contractions were fairly steady all throughout the next morning and they started helping me manage the pain. Tuesday evening, they moved us into a delivery room and our son, Connor, was peacefully born still at 5:41pm on October 27, 2015 at 2lbs 12oz and 15" long. Mandy arrived shortly afterwards, as did my parents and sisters. My mom had bought a little preemie onesie and even that seemed huge on him. We spent a few hours with Connor, holding him and trying to memorize every little feature. He was absolutely perfect. The nurses and doctors were so compassionate and let us have all the time we wanted with him. We said our final goodbye and moved back to our antepartum room. After making some arrangements, filling out paperwork and speaking to the doctors, we were discharged around midnight. The next few days were a flood of visitors, flowers and hugs. Very much appreciated but also very overwhelming. One thing I did not put much thought into was that even though my baby had passed, my body did not know that, causing me to experience all the joys of post-partum motherhood, with a houseful of neighbors and relatives. I also learned that with any birth after 20 weeks - live or still - you are entitled to a maternity leave of 17 weeks. Although, I thought at the time I would want to go back to work soon to stay busy and occupy my mind, I quickly came to the realization that I was physically and mentally exhausted. I needed that time away from work and I am very fortunate to have a very understanding employer and group of coworkers who are so supportive. The following few weeks were so tough. I felt angry. I blamed myself, I thought "I should have known," I felt like I had let down my husband and robbed his child from him. All I could think about was how unfair this whole situation was. Living in a small rural town, there were plenty of our friends having babies at the same time. I felt envious, why did they get to have these beautiful, precious, healthy babies and we didn't? Looking back I realize these are all normal parts of the grieving process, but at the time, I did not feel normal. Especially once the world starts moving again at its everyday pace and you are still standing there thinking "did that really just happen?". One thing my doctor reiterated to us, was that there was no point of intervention; no way we could have known we were going to lose Connor, and nothing we could have done. While, off the start, this didn't make me blame myself any less, I think the more I repeated it, the more I started to believe it. She also told us, repeatedly: whatever you need, we will get you through this, one day at a time. One of the most comforting things after Connor’s passing, were messages from friends and family members just letting us know we had their support, prayers and love. It was a great reminder that we weren't alone and had so many wonderful people who loved us and cared about us and our child. I don't know if there is a right thing to say or do when someone is experiencing grief. I think the best thing to do is to reach out to them, in whatever way you can, and let them know that you care and that they are not alone. The home cooked meals and frozen casseroles were another blessing. It was so nice in the time following, to be able to pull something out, and not have to think about cooking. We also received many thoughtful and beautiful gifts from family and friends. Although it was such an overwhelming time for us, not one of these heartfelt gestures went unnoticed, being surrounded by so much love and kindness helped our hearts start to heal. 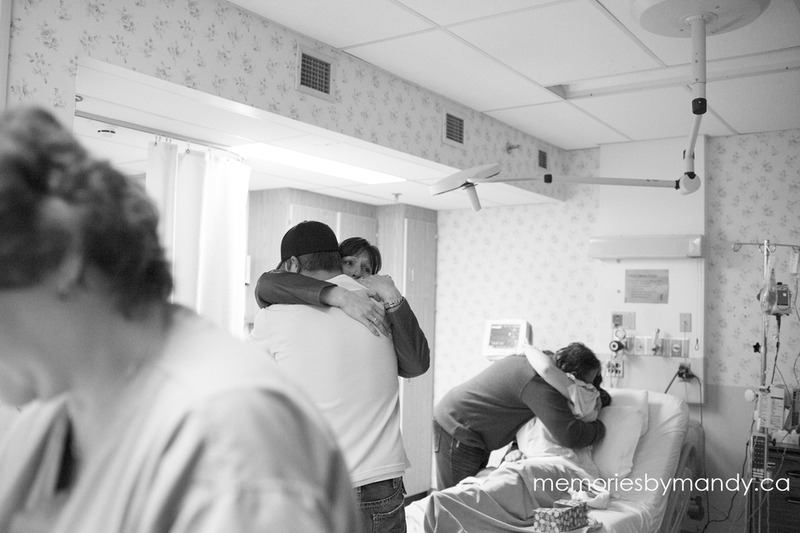 The photos that Mandy took, have helped me heal so much; they are a precious memory that we will always have to help us remember our beautiful baby boy. I will always be so grateful to Mandy for her professionalism, thoughtfulness and compassion, there is no value I could ever place on the memories that she captured for us." Empty Arms Perinatal Loss Support Services Inc. is a new charity that serves Saskatoon and area. It is the legacy of my daughter, Jael Herchak, who was born still at 20 weeks gestation on May 6th, 2013. 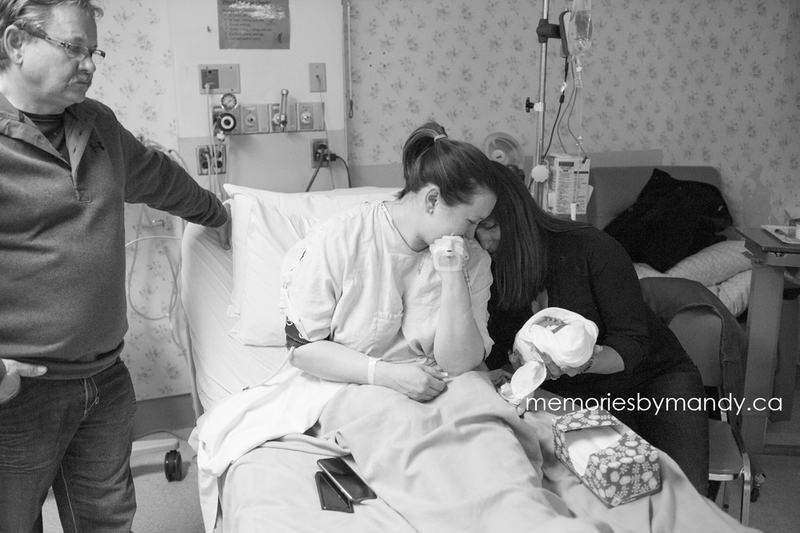 After Jael was born, my husband and I left the hospital in shock and heartbroken. After some time, we began to regret all of the things we did not do before we said our final goodbyes to Jael. The time a family has with their little one is far too short and so very precious. Experiencing the death of a baby, under any circumstances, is such a lonely experience and having the specialized supportof someone who can help navigate those moments can make all of the difference in the world. We want to ensure that families make the most of the time they have with their baby and that their experience is as positive as possible, given the circumstances. We offer support and services to families whose babies die before, during, or after birth in any trimester. Circumstances under which we offer support includes, but is not limited to: miscarriage, missed miscarriage, stillbirth, difficult diagnosis, carrying to term (CTT) or termination for medical reasons (TFMR) in the case of a fatal diagnosis, or neonatal death. If someone has experienced/is experiencing a loss, how do they go about getting help? What is the cost for people wanting to get help from our organization? All support and services are offered absolutely free of charge to families. How does someone donate to Empty Arms and where do the donations go? - An e-transfer can be sent to donations@emptyarmpls.com The answer to the security question can then be sent in a separate email. All donations made to Empty Arms go towards supporting baby loss families. Operating a charity such as Empty Arms is no small feat and, since we do not charge families for any services, there are many costs associated with offering this type of support; things such as gift bags of mementos for families, honorariums for our birth & bereavement companions and photographers, supplies for the volunteers….We are a provincially registered non-profit organization (Nonprofit # 101286444) so any money raised/donated goes towards our goal of ensuring baby loss families have the support and resources they need. Since we are a registered charity (Charity # 80982 6969 RR0001) we are able to issue receipts for income tax purposes. No matter which method is chosen for making a donation, we require the following information in order to issue a receipt: Full name (including middle initial) Mailing address and email address. We appreciate donations of any amount, but we are only able to issue receipts for donations of $25 or more. Receipts are issued electronically within 5 business days of processing. Yes, we are definitely interested in acquiring more volunteers! In order to reach the point where we can make sure we are able to provide support and services to any baby loss family who may be interested, we need a large group of individuals willing to be on call at designated times. We are looking for professional photographers, people who may be interested in certifying as a birth & bereavement doula, people who are interested in training to offer only bereavement support after baby is born, and ‘veteran’ baby loss parents who may be interested in offering 1-on-1 peer support to new perinatal loss parents. Due to the sensitive nature of these positions, we do have a process for learning more about those interested. This includes an application, information forms, an informal interview, and a criminal record check with a vulnerable sector search. We also welcome volunteers who may be interested in helping with fundraising endeavors. Those interested can send an email to info@emptyarmspls.com, indicating what volunteer position they would like more information about or what they are interested in applying for.